Christopher Mayhall graduated from the University of North Carolina at Greensboro with a B. S. in Accounting. He began his career as a public accountant before shifting into the banking industry, where he worked for 12 years in Commercial Real Estate Lending. In early 2012, he purchased SERVPRO of South Mobile County. He has spent the last few years growing his business into what it is today. He is passionate about every aspect of SERVPRO. He spends his free time with his wife, Rachel, their four children, Lusher, Madison, Ella and Julia. When they are not participating in sports they love to spend time on the water. Christopher Bryant has been a Crew Chief with SERVPRO of Southwest Mobile for a little over a year now. Prior to SERVPRO, Christopher worked in the landscaping industry and as a termite technician. He enjoys his job because he likes putting the customers at ease and seeing the smile on their face when he helps them. When he isn't working, Christopher spends his time rebuilding motorcycles, volunteering and cooking for friends and family. Miriam Randle joined our team after working in the hospitality industry. Known as Moon by everyone here at SERVPRO, she recently moved back to the area from Portland. Although she enjoyed the experience, Moon says she is glad to be back in her hometown. During her time in Portland, Miriam said she always saw our trucks around town. After a little investigating she became interested in Fire Restoration and that is what brought her to take on her current role as a Crew Leader in Fire/Cleaning. Miriam says the best part of her job is being faced with new challenges everyday and learning new skills. When she is not at work Moon loves spending time watching sports with her family of die-hard sports fans! John Vulevich is a graduate of McGill Toolen High School and the University of Alabama. John previously owned his own successful landscaping business before deciding to sell and take on new opportunities. 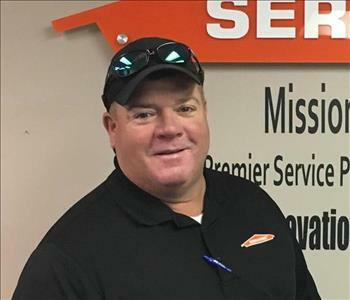 John, in addition to being a Production Manager with SERVPRO of South Mobile County, continues to work in the landscape and construction industry. He says his years of experience have served him well in the areas of customer service, sales and management. John says that he enjoys his current position as Production Manager because it challenges him daily and requires unique problem solving solutions to manage each situation. John and his wife of 14 years have three amazing kids. When not working with SERVPRO, he invests much of his spare time in to his side business. He produces gourmet pecan wood chunks for smoking and grilling that he sells to individuals and restaurants throughout the area. John spends time off relaxing and cooking for his family, or just hanging out on Mobile Bay or the Delta. As our Office Administrator, Kelsie wears many hats here at SERVPRO of Mobile Northwest keeping her on her feet. When she isn’t at the office, this self-professed “Sports Mom” keeps up the hectic pace, shuttling her two sons to practices and games. Making her kids happy and being a great Mom are her top priorities and makes the busy schedule all worth it. Kelsie is also a foodie and says her dream job would be a food taster that travels the world dining on exotic dishes. When it comes to a favorite she says it’s hard to choose but a couple of her guilty indulgences include dark chocolate and Dr. Pepper. Around our SERVPRO offices, Kelsie is always there with a smile, ready to lend a helping hand to anyone who needs it. We are so excited to have her as a part of our team!